quality of the nation’s leadership since the first half of the 19th century. The book grows out of the research for a series of television programs that Karma Ura prepared for the Bhutan Broadcasting Service (BBS), which were televised between 2008 and 2010. It would be extraordinarily interesting and useful if BBS were to issue the original television programs on DVDs for sale to the public, both Bhutanese and foreign, because they, together with Karma Ura’s book, would provide accessibility to an important perspective on our modern history both for the public at large and, more pointedly, for our high school and university students, whose knowledge of our history is not well served by the textbooks provided for them in the schools. Karma Ura not only provides a broad and sweeping view of Bhutanese leadership; he fills his story with small but expressively significant details. 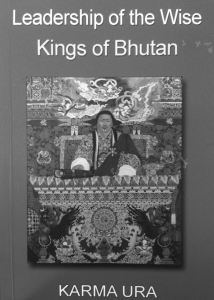 For example, we find out that the Second King ‘was the initiator of modern sports in Bhutan’ (p. 56). Evidently he was an accomplished archer, and ‘His arrows really were king size; much thicker and longer than the ones seen today.’ The chapter devoted to the Second King is very important precisely because the Second King seems to play a relatively minor role in the public imagination, compared to our other kings. The details this chapter provides, therefore, are prized. The same attention to illustrative detail characterises all the chapters of the book. This volume raises an important question for future historians of Bhutan, however, and it is this: Where should we draw the line between history and hagiography? While Leadership of the Wise is both sweeping and insightful in its content, its language and style is hagiographical. While this could work for the Bhutanese audience, it may be off-putting for some foreign readers, who may, therefore, be less inclined to absorb the lessons about leadership that Karma Ura provides by indirection. Similarly, one wishes that the author had provided a concluding chapter for the book, a reflective essay on what the world can learn from the kind of leadership he describes. It is not clear what Karma Ura considers to be the vital ingredients that produced the wise leadership that is the subject of the book. How would he weigh such factors as the kings’ personalities, their own vision of leadership, their understanding of the conditions in the world surrounding Bhutan, the sources from which they drew their knowledge about both the world and about kingship? The reader would like to know, to the extent that such information may be available, how Bhutan’s kings understood themselves, how each arrived at the particular style that characterised his reign, how their distinct personalities were reflected in the governance of the kingdom. The book has a certain catechetical structure that is undoubtedly the consequence of its paternity in the BBS television series. This style is particularly useful if it spurs the reader to reflect on some important questions that author does not answer. This is one of the great values of this volume––it raises many rich questions for younger historians to take up. And it points to the fact that we have few if any well-trained young historians who in the coming decades will take up the questions that Karma Ura’s work raises. The study of, and writing about, a nation’s history is quintessentially important for the development of a national narrative in support of the goals the nation sets for itself. Indeed, it can be argued that where democracy works, it works because the national narrative supports it. This volume whets our appetite for more. Karma Ura is one of our most accomplished scholars and public intellectuals. It would be of immense benefit to Bhutan if he were to prepare a second and expanded edition of this work.